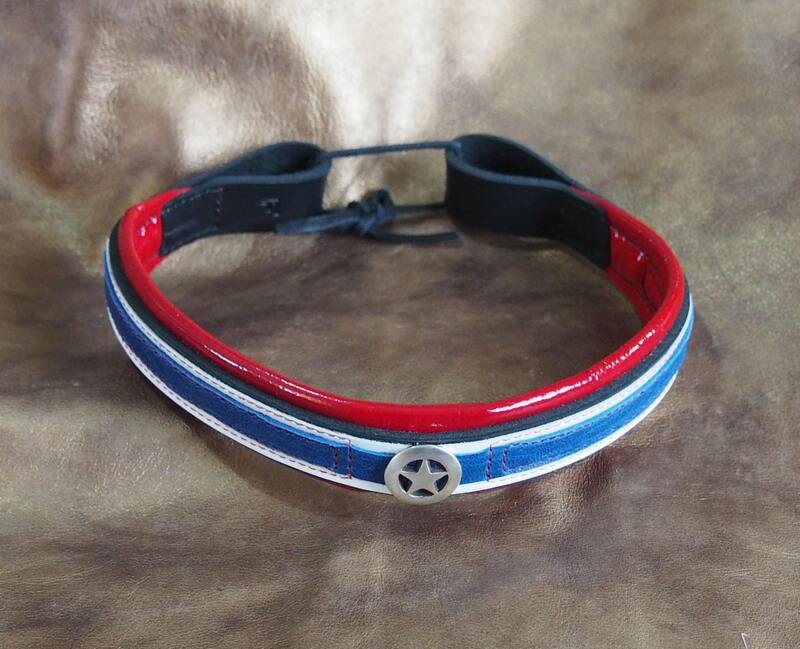 Red, white & blue leathers with star concho are fixed to thick black cowhide for this unique show brow band. 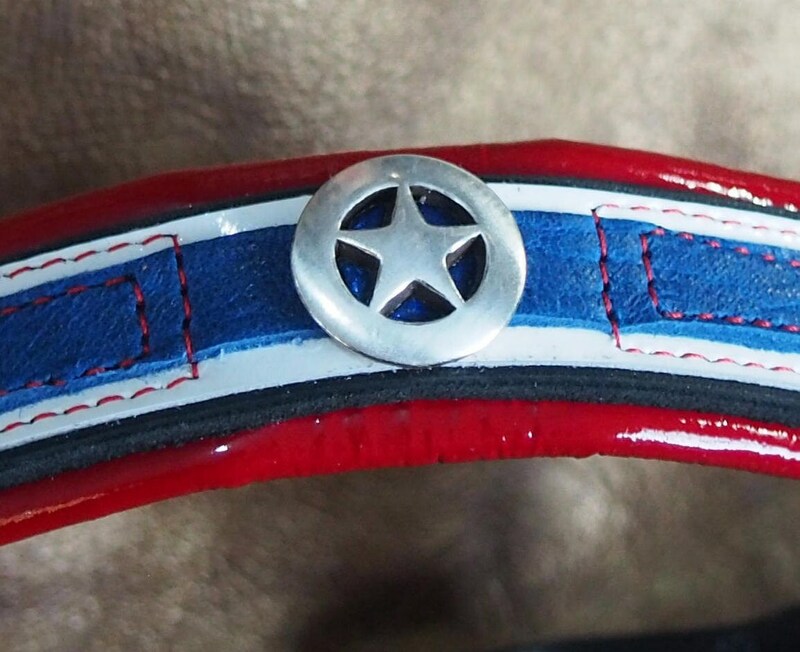 The 3/4" silver nickel concho has halographic blue leather in the center, and is set into three layers of leather, backed with the padded lining, so the screw back is against the padding, not your horse! 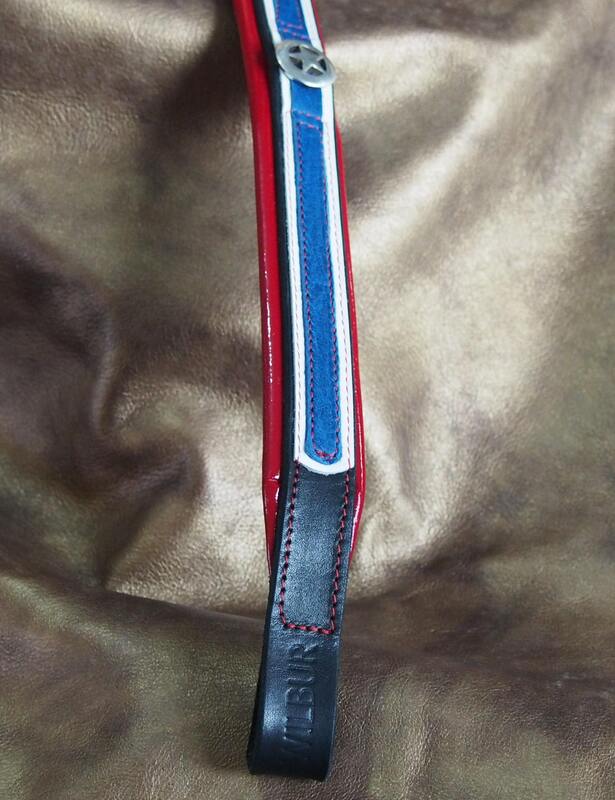 The blue bison leather strip is 3/8" wide, glued over 5/8" white patent leather, and glued to the 3/4" wide black main strap. Then the concho screw threads are fixed with red Loctite to ensure it doesn't come loose. 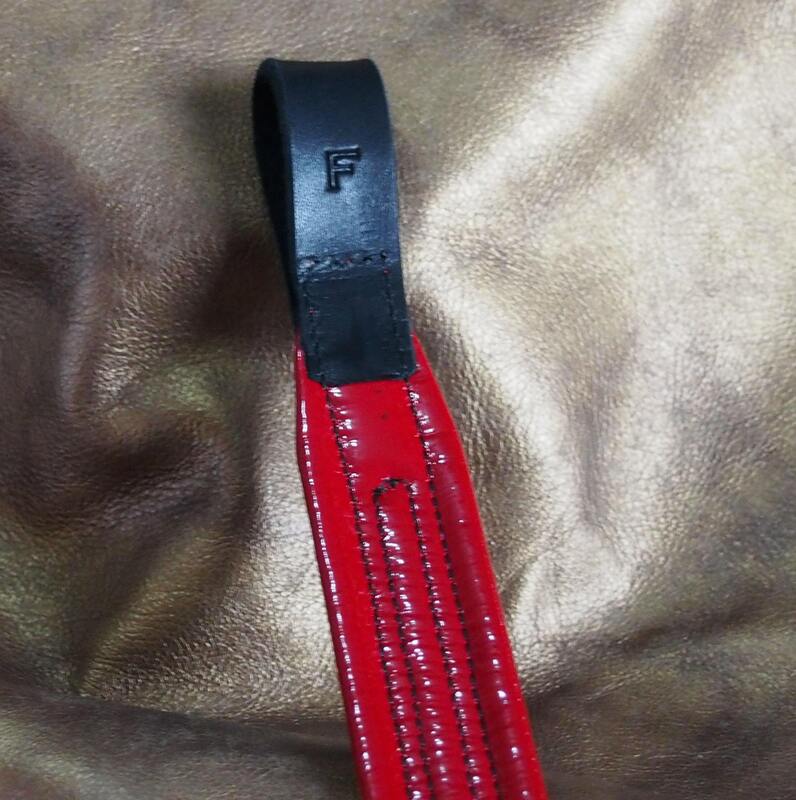 The red patent leather wrapped padded liner is 1 1/8" wide to provide a good reveal of red, and then glued to the band & concho, and red thread (upper) is used to secure all layers together, and edge the leather strips as well as secure the loops closed. 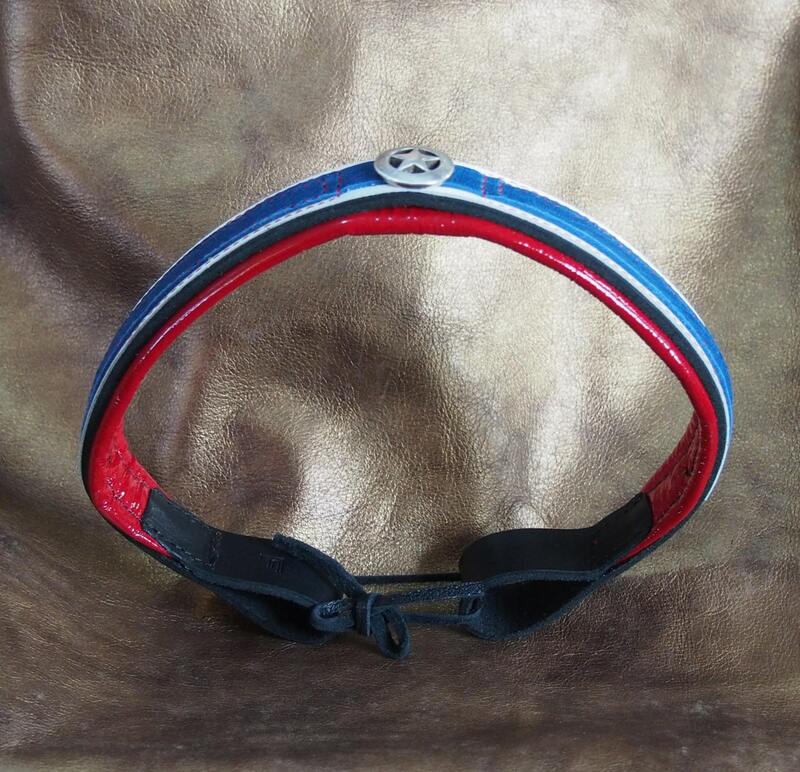 The loop ends leave about 1 1/2" open to accommodate most bridles, but if you need something different, please note in the order--since all of these bands I design and fabricate in my home studio, I have full control over all elements and dimensions! All edges of the main band are beveled for a clean finish. The band will be carefully wrapped and comes with a round wooden box which can be used to store the band when its not in use, or hold other goodies. The sizing is based on traditional brow band dimensions for Pony (14.5"), Cob (15.75"), Full (16.5"), and Warmblood 18"), but I can easily modify to fit your horse if one of these sizes doesn't work.